New statistics published by Pancreatic Cancer Action today reveal that in 2015, pancreatic cancer was 17% more common in the UK than in 2010, reaching an annual incidence rate of almost 10,000 new diagnoses. During the same five-year period, mortality rates for pancreatic cancer increased by 13% with almost 9,000 people dying from the disease. Pancreatic Cancer Action, a UK charity that exists to save lives through early diagnosis, are calling for urgent action to tackle late diagnosis of the disease. Pancreatic cancer is the UK’s fifth biggest cancer killer. Based on the data collected from UK cancer registries, the disease accounts for over 3% of cancer diagnoses in the UK – and more than one person is diagnosed in the UK every hour! This increase is faster than predicted by Cancer Research UK who has estimated that more people will die from pancreatic cancer than breast cancer by 2030. 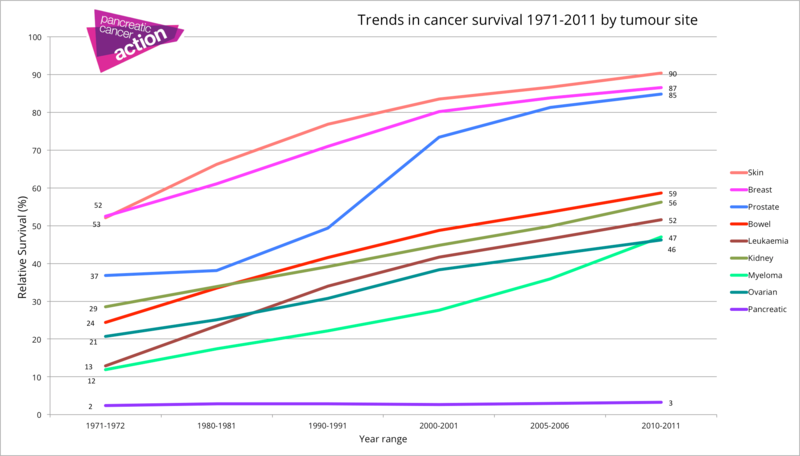 An ageing and growing population will lead to an increase in cancer cases. However, for most cancer types this will be offset by decreases in death rates due to improvements in early detection and/or treatment so that the number of anticipated cancer deaths will fall. This is not the case for pancreatic cancer. 8 out of 10 people diagnosed with pancreatic cancer will be diagnosed too late for surgery, the only potential for a cure, and most will die within a year. Pancreatic cancer is the only common cancer to be increasing in both incidence and mortality rates. “More and more people are being diagnosed and dying from pancreatic cancer year on year – and it is a trend that, if not tackled head on, will lead to more people receiving a late diagnosis.